I am very new to CARTO and have very limited coding skills. I have a data set of points representing the centroid of zip codes. Each point has an associated average commute time. It is relatively straightforward in CARTO to create a 15 minute drive-time buffer for all data points. But is there a way to make individual drive time buffers based on each point's average commute time? Import the template .carto file packaged from “Download resources” of this guide and create the map. Builder opens with TRI point data as the first map layer, and Census Tract polygons as the second map layer. From the TRI map layer, click the ANALYSIS tab. Click ADD ANALYSIS and apply the Create Travel or Distance Buffers option. This is the input layer used for creating the travel or distance buffers. the radius equally by the number of tracts. Dissolved as the BOUNDARIES. This parameter enables you to define the polygon outlines as intact (keeps the original boundaries intact for overlapping buffers), or dissolved (dissolves the boundaries of overlapping buffers). To create different individual drive time buffers you can't use BUILDER, as it's not parametrized by a field. Instead, you need to use SQL directly to UPDATE your dataset with the geometries. So if your field for the commute time is commute_time then your query would look like the following queries. Mind that I'm putting the points as latitude/longitude to avoid having to use two tables. I will do the process from scratch creating a table and adding some fake data, you should only have to apply the last query adapted to your scenario. 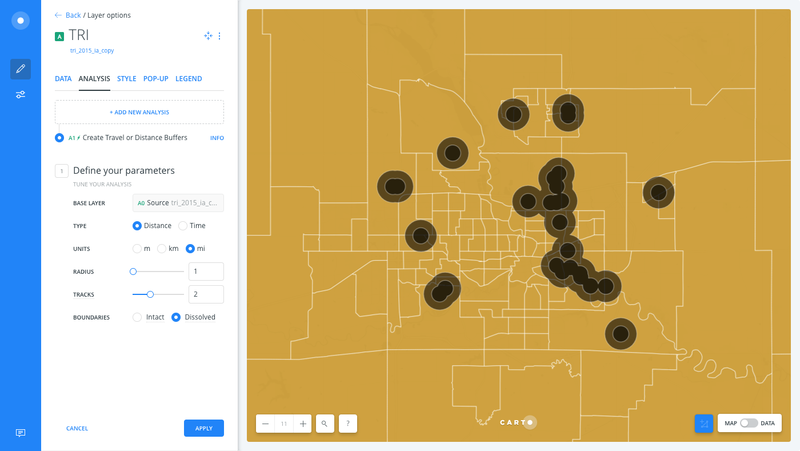 In CARTO, you can style points as buffers based on individual column values (such as average of commuting time) using both CartoCSS (used in Builder and CARTO.js) and CARTO VL. A living example can be found here. Not the answer you're looking for? 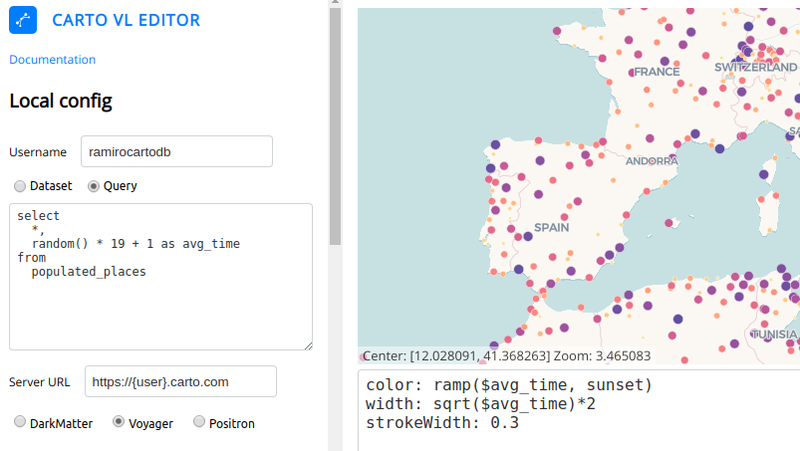 Browse other questions tagged postgresql carto cartocss css carto-vl or ask your own question. PostgreSQL: How to use more than one CPU? Moving PostGIS database for Social Media to Cassandra? How do you change the titles displayed inside infowindows in Carto? How does one populate a column in Carto with calculated values that have rounded decimal places? How to show aggregated values in a CARTO BUILDER popup?